Over 600 media representatives have applied to cover the visit of Pope Francis to Armenia on June 24. YEREVAN (Arka)—More than 600 media representatives have applied to be accredited to cover the visit of the Pope to Armenia, Armenia’s Ministry of Foreign Affairs said on its Twitter page. 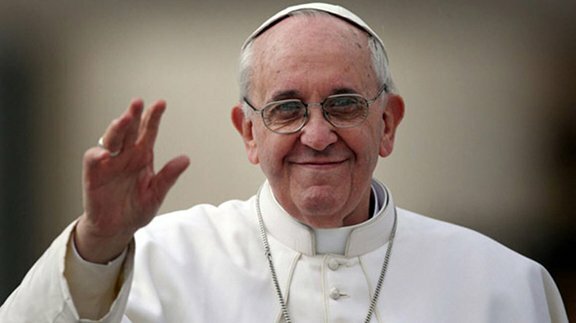 Pope Francis’ visit to Armenia will commence on June 24 with an official welcoming ceremony at the Zvartnots International Airport in Yerevan before the Pope’s travel to the Mother See of Holy Etchmiadzin, where a welcoming service will be offered in the Mother Cathedral. In the evening, Pope Francis will meet with President Serzh Sarkisian, then with the authorities, community leaders, and representatives of diplomatic missions accredited in Armenia. The first day will conclude with a meeting at the Mother See of Holy Etchmiadzin, with His Holiness Karekin II, Supreme Patriarch and Catholicos of All Armenians. On the morning of June 25, His Holiness Pope Francis will visit Tsitsernakaberd, the Armenian Genocide Memorial Complex and Museum in Yerevan. Pope Francis, along with His Holiness Karekin II, will visit the city of Gyumri, where a Divine Liturgy will be offered in Vardanants Square. The Pope will also visit Our Lady of Armenia Convent of the Congregation of the Sisters of the Immaculate Conception in Gyumri, then the Seven Wounds Saint Mary Church of the Diocese of Shirak of the Armenian Apostolic Holy Church and the Holy Martyrs Armenian Catholic Cathedral. In the evening, an outdoor Ecumenical Service and Peace Prayer will be held in Yerevan – in Republic Square. On June 26, in the Mother See of Holy Etchmiadzin, Pope Francis will meet with Armenian Catholic bishops, and then participate in a Divine Liturgy and an Ecumenical dinner, along with His Holiness Karekin II, the Archbishops and Bishops of the Armenian Apostolic Holy Church, Armenian Catholic Archbishops and Bishops and the Papal delegation. Pope Francis will also meet delegates and benefactors of the Armenian Church. His Holiness Pope Francis and His Holiness Karekin II will sign a joint declaration. The Spiritual leaders will offer their prayers at the Khor Virap Monastery, following which Pope Francis will depart for Rome.. If today world political Leaders got 1% of Papa Inteligence and Spirit , we would be in much woderfull world. I absolutly LOVE His Holiness Pop Francis. He is a TRUE CHRISTIAN MODEL for all Christians to fallow. Only a thought of him brings light and joy in to my spirit. Thank you Your Holiness Pop Francis for being with us, within us in our thoughts, souls and our prayers. Let God give you long and healtjy life to lead all Chritians to the purity in our beliefs. WELCOME TO THE LAND OF NOAH YOUR HOLINESS POP FRANCIS!!! Let God give you long and healthy life to lead all Chritians to the purity in our beliefs.